Blue Star Marine, LLC is solely female owned and managed by Cher Walker. Daily operations are managed by Darrell Walker. Cher and Darrell make a strong business team utilizing a fleet of vessels: M/V Blue Star, M/V Mantis, M/V Tanque, and M/V Tinque. Vessels are operated by USCG licensed 100-ton Masters and are commercially insured, each having its own individual usages, thereby fulfilling the many needs of our clients. 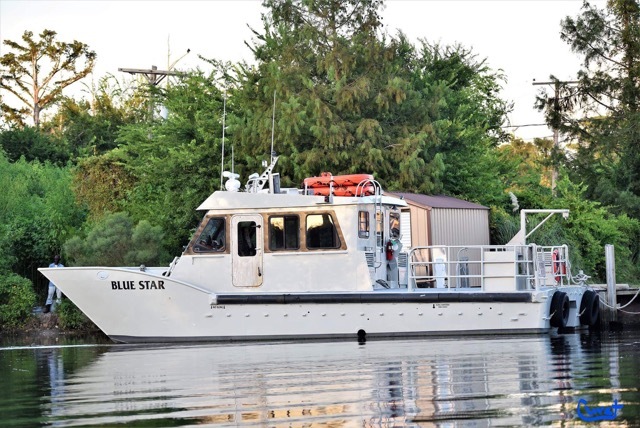 M/V Blue Star is a 45-foot 2007 aluminum catamaran designed by Fyffe Yachts and custom-built by GEO Shipyard in New Iberia, Louisiana, which is a USCG certified and inspected vessel with an 18-passenger capacity. Its Twin 490 HP Cummins marine diesel engines lends itself to inshore and offshore launches, crew changes, and commercial dive operations. M/V Blue Star has a 24-knot cruise speed, a 2.25 long ton deck capacity allowing for multi-functional use (buoys ,equipment, and/or various materials), M/V Blue star has recently had a complete electronics upgrade which includes state of the art navigation, digital radar, and night vision. M/V Calcasieu Express: Blue Star Marine is proud to announce the latest vessel in our fleet, Calcasieu Express! It's a 44' aluminum deckboat built by Razorhead and capable of 25 knots. The vessel will allow us to transport up to 8 passengers, as well as, pallets and ship stores. M/V Mantis is a commercially certified 36-foot 2009 aluminum high speed catamaran capable of 50-knot speed. M/V Mantis is custom-design by Viking Fast Craft and built by GEO Shipyard in New Iberia, Louisiana expressly for Blue Star Marine, LLC. Because of its lightness and streamlined build, the primary purpose of the Mantis is to deliver personnel and packages, etc to ships anchored offshore of Louisiana and Texas in the Gulf of Mexico. It is equipped with two 300 HP Susuki Outboards, one 6 KW Westerbeke generator, an air-conditioned cabin,Ray marine Electronics including a 12-inch Navigation system, AIS, Autopilot, and a 48-mile Radar. M/V Mantis is capable of carrying a maximum of 6 passengers and 1100 lbs of cargo. M/V Tanque is a 48' utility boat refurbished in September 2013. M/V Tanque is equipped with a 5-ton IMT deck crane to support multiple operations, including commercial diving, salvage and environmental responses. Note: Not pictured M/V Tinque is a 24-foot work skiff used for various inshore services. Blue Star Marine, LLC provides marine crew launch services, commercial diving services, buoy maintenance and installations, reef site inspections, environmental clean-up, marine surveys, marine delivery services, and maritime securities to many agencies along the Louisiana and Texas Gulf Coast. Launch services included but not limited to transportation for crew, surveyors, and stores to offshore and inland vessels in both Calcasieu Pass and Sabine Pass. Ongoing experience working directly with USCG, BOEM, BESE, Texas A&M Research Foundation, NOAA, etc. Blue Star Marine adheres to a comprehensive "Standard Operational Procedures and Safety Manual"
Blue Star Marine's personnel are highly trained, professional, and have unique skill sets for this type of specialized marine operations.